Many people think of cruises as floating restaurants which stop at various shopping outlets, in warm locations. 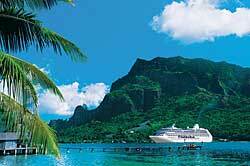 We would like to tell you that there is much more to cruising than a week in the Caribbean. Cruise ships come in many sizes and shapes and sail the seven seas, providing a myriad of tour opportunities. Large cruise ships are also an excellent choice for those large family get-a-ways. One great advantage to a cruise tour is being able to travel from one destination to another without having to waste time and energy packing and unpacking and checking in and out of hotels. At the end of a busy or relaxing day ashore, all you need do is come back on board and head for the dining room and the show. Perhaps the idea of traveling with 2500+ other passengers is not your idea of a fun time. We are going to introduce you to several other cruising possibilities that fall way outside of what we have come to expect from cruises. We were most impressed with the quality of this first cruise. We thank Senior Travel Consultants for all of their help and effort is making all the arrangements for our trip to Bermuda.